The Extreme Housewife is at it again! Not content with Toasting the Mona Lisa and making Pippa Middleton out of Crumpets, she has now made a Lady Picking Tea out of sugar cubes! 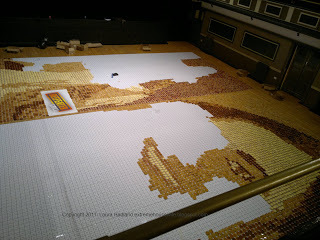 A total of 4220 cubes were needed, taking two months to hand paint and glue into position! This entry was posted in Art and tagged Art, cubes, extreme housewifery, mosaic, sugar, tea on November 16, 2013 by The Crystal Wizard. Ray Mears Extreme Housewifery: The Pippa Middleton Crumpet Mosaic!. Do you like crumpet? Do you like Pippa Middleton? Then you’ll love The Pippa Middleton Crumpet Mosaic! Extreme Housewifery takes an artistic turn, as 15,000 crumpets are laid out across Warrington’s Parr Hall to immortalise Ms Middleton’s image in breakfast-based art! Produced as a publicity stunt for Beefeater Grill’s new breakfast menu in 2011, it took a full day to spread jam, marmite and butter onto the crumpets and place them out across the hall. This entry was posted in Art, Behind The Scenes and tagged Art, crumpet, extreme housewifery, middleton, mosaic, pippa, royal, wow! on September 15, 2013 by The Crystal Wizard.